Humans did not walk on the moon until 1969, but their imminent arrival was slotted on the world's calendar from the very beginning of the decade. Space exploration's grip on the popular consciousness during the 1960s contributed to a new fashion philosophy, becoming a pool of design inspiration; an analog to speculation about a radically transformed future that preoccupied the sensibilities of the decade. In the April 1965 issue of Harper's Bazaar, Richard Avedon photographed British fashion model Jean Shrimpton wearing an astronaut's helmet and flight uniform. But it was hardly necessary to don an actual flight suit to be part of the styles that came to be known as "space age." Sleek as a fuselage, space age fashion emulated the aerodynamic simplicity and severity of a space capsule. Frills and flounces were eschewed in favor of a new, hard-edged and streamlined silhouette that also incorporated industrial materials. Space age fashion created a brusque and frequently shocking brave new universe within the 1960s fashion cosmos. As a design movement, space age fashion was above all a French phenomenon, promulgated mostly by men in their thirties who had been trained in the old-guard Paris couture, but saw the need to refute some of their pedigree. André Courrèges was perhaps the most creative. Courrèges was a member of Balenciaga's couture house for ten years before beginning his own business in 1961 in partnership with his wife Coqueline, who had also worked for Balenciaga. It took him but a couple of years to find his own feet, and when he did he kicked out the props from under establishment couture. "Things have never been the same since Courrèges had his explosion," Yves Saint Laurent said in a 1966 Women's Wear Daily (9 December, p. 1). Before turning to fashion, Courrèges had dallied in both architecture and engineering, and this was reflected in his clothes. His dresses, suits, and trouser suits might be fitted, semi-fitted, or tubular, but they presented a bold and graphic silhouette, delineated as interlocking geometries by welt seaming and strategic piping. He preferred a restricted palette of monochromes and pastels, and was partial to aggressive checks and stripes. Courrèges used white a great deal, exploiting its myriad and contradictory connotations of sterility and/or purity as well as all-inclusive spectrum-spanning synergy. Courrèges's work surely owed a debt to London ready-to-wear, but ever present in his work was the active, constructing hand of the couturier. His fabrics were flat, tailored wools, more intractable than what ready-to-wear was espousing. In a Courrèges suit a woman herself became a Brancusi-like distillation, an avatar of streamlined strength. Courrèges inveighed against the traditional appurtenances of femininity and foreswore the curvilinear. Reaching his meridian in 1964 and 1965, he advocated very short skirts as well as pants for all occasions, at the time a highly controversial proposition. "Working women have always interested me the most," Courrèges said in Life Magazine in 1965. "They belong to the present, the future" (21 May, p. 57). Yet what he produced could not be easily transferred to the workplace, although his clothes and mass-manufactured imitations were seen on streets around the world. He offered what might be considered fashion manifestos. For him, high heels were as absurd as the bound feet of Asian women. He outfitted his models, instead, in flat Mary Jane slippers, or white boots that enhanced the graphic rectangularity of his silhouette. After six years working for Balenciaga, Emanuel Ungaro assisted Courrèges for one year before opening his own doors in 1965. He also promised a radical departure from couture business-as-usual, pledging that there would be no evening clothes in this first collection, since he did not believe in them. He was certainly Courrèges's disciple during these years but his suits and dresses in childlike flaring shapes were gentle and more ingratiating. Essential to the success of the young house as unique fabrics designed exclusively for him by his partner Sonia Knapp. Knapp worked as closely with Ungaro as Coqueline Courrèges did with her husband. A decade older than Courrèges or Ungaro, Pierre Cardin began his own business in 1957 after apprenticeships at several couture houses. During the epoch of space age, Cardin offered some of the couture's most outré designs, offered like so much during the 1960s as provocative hypothesis rather than empirical prototype. His shapes might resemble floral abstractions that devoured conventional clothing dimensions. His enormous collars and frequent use of vinyl evoked outer-space gear. Cardin was a Renaissance man whose many endeavors included his own theater. Both Courrèges and Ungaro established ready-to-wear and licensing franchises, but Cardin's endeavors were waged on an exponential scale. His empire included a highly successful men's wear line-"Cardin's cosmonauts" presented a complementary vision of men's apparel. Like much of Cardin's ideas, Paco Rabanne pushed space age fashion toward wearable art. He too trained as an architect, then designed accessories, before the young designer created a sensation in 1966 with ready-to-wear sheaths of plastic squares and discs attached to fabric backing. They were le dernier cri of Paris fashion, memorably commemorated in William Klein's film of the same year, Qui Etes Vous Polly McGoo. For him the new and ultimate frontier of fashion had become "the finding of new materials." His investigation of plastics and other hardware as possible human carapaces proclaimed a new epoch in Paris's wonted tradition of clothes so intricately constructed that they could stand on their own. Space age fashion was gestated in a salon environment that was just as stark and unadorned as the clothes. 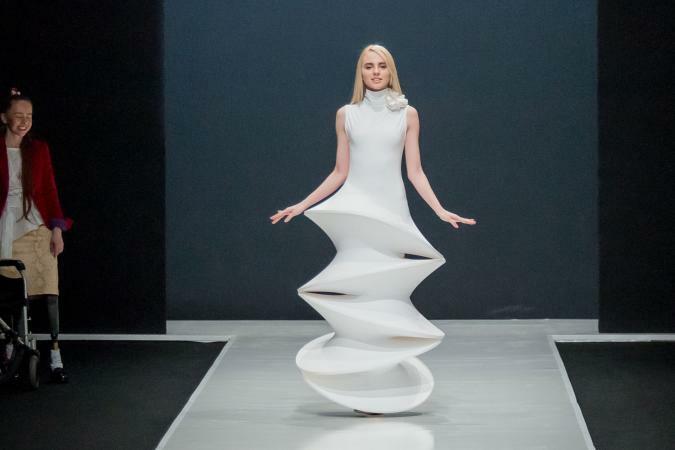 New-style fashion shows went hand in hand with the fashion experiments they showcased. They were hectic rather than stately, built around mysterious theatrical effects rather than the old-style hauteur. In the early 2000s, space age styles seem a paradigm of the teleological mentality of the 1960s, a last glorification of industrialization before the realization of its downside. Hard-edged fashion stayed influential all through the 1960s, eventually being vanquished by the unconstructed fashion that prevailed during the first half of the 1970s. The leaders of space age fashion have all remained in vogue, and from time to time pay homage to their bellwether work of the 1960s. See also Extreme Fashions; Italian Futurist Fashion. Ryan, Ann, and Serena Sinclair. "Space Age Fashion." In Couture. Garden City, N.Y.: Doubleday, 1972.